Flow cups are still the most important test instruments for the rapid determination of viscosity of liquids in the lab and in production processes. However, the flow cups are suitable only for low-viscosity liquids, but not for highly viscous substances such as pastes, etc. The most accurate results are obtained for liquids with Newtonian behavior. In that case, the flow cups take a certain volume of liquid that can flow out through a small opening. The result is expressed as time in seconds which is takes for liquid, till the first irregular flow occurs. For many applications it is not necessary to know the absolute viscosity of paints and varnishes. Mostly the flow time, measured in seconds, is enough for the relative classification. It is determined with a flow cup in various designs. In case of viscosity cup it goes about a hollow cylinder, which ends in a permanently installed nozzle. A spillway serves for collecting the excessive liquid. 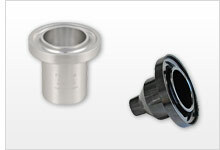 In general, the flow cups themselves are made of anodized aluminum, while the nozzles generally consist of stainless steel. Various designs and types of flow cups are available, depending on the liquid to be tested and depending on the required standard. Many models can be ordered in our shop (Ford, ISO, Anfor). If you have any questions, please contact us at or +44 (0) 2380 987 035 for PCE Instruments UK or +1 (561) 320-9162 for PCE Americas Inc.
A DIN flow cup meter is a viscometer to determine the toughness of liquids. It is commonly used in the industrial sector as well as in research laboratories. However, only low-viscosity liquids can be measured by means of this method as liquids cannot pass through the nozzles if their viscosity is too high.